For those of you landing on these pages for the first time – welcome! – and those coming back for the nth – thank you! – some exciting things are a-happening on this side of the blogosphere. nibs etc. is bringing #ThinkBeforeYouToss off the screens and onto the streets. Supper clubs. Pop Ups. Bespoke events. Catered in and around London. I want to fight this #WarOnWaste with you. We all know that a picture can say a thousand words. But nothing can quite say it like all of our very own 5 senses. Which is why I feel that the best way to convey the beauty and possibility of ‘unloved’ ingredients, ‘wonky’ produce, and all those other odds and ends we’re never really quite sure what to do with, is to serve it to you myself – not quite on a silver platter, apologies – for us all to see and touch, smell, hear and taste. I want you to love food, all food, so much, that the thought of throwing out even the peels, stalks and day old leftovers is put into question. Let's be food hoarders together. This past weekend I catered my first event. It was a private fund raiser for contemporary traveling opera company Opera Up Close doing opera a little bit differently, with a model perhaps a little more sustainable than most, and most importantly, up close and personal. Their curated menu consisted of 5 canapés, inspired by and composed in part using donated, ‘waste’ ingredients – juice pulp from Bumpin Rinds, bread from Bread Ahead – with the sole mission of breathing new life into ‘unloved’ ingredients, and proving that said ingredients can be both beautiful and delicious. I was approached, at the end of it all, by a group of guests: “you’ve really inspired me with some of your recipes." And that alone, is why I’m so passionately on a mission to spread #ThinkBeforeYouToss. To be first to know about nibs etc. events, supper clubs and popups of the like, there is now a – NEW – Newsletter, Event Contact Page for inquiries, and of course, the trusty Instagram for a little visual inspiration and event updates. 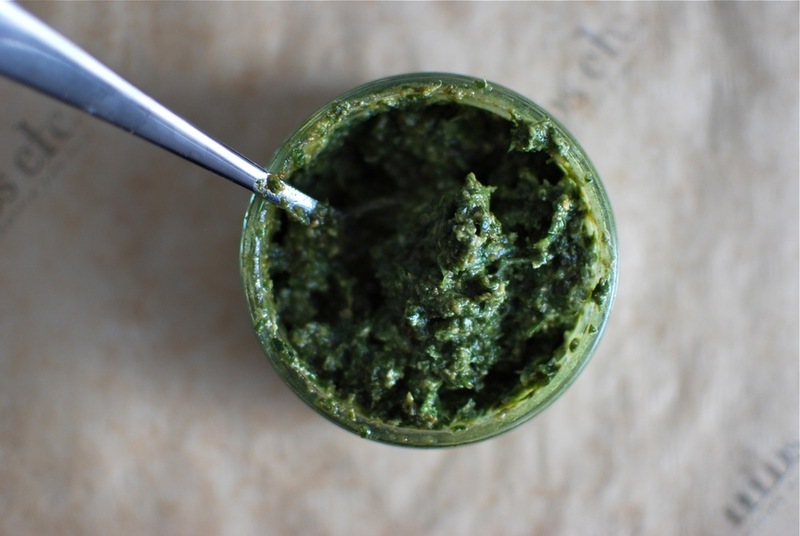 So in the spirit of it all, because summers are often synonymous with pesto in all its various forms, I wanted to share with you a condiment from this past weekend’s favourite – mine at least! – canapé: Carrot Top Pesto. Buy your carrots from the market. They’ll come with mounds of bright green fronds, and perfect carrots for dipping. [You could of course grow your own but sadly our miniature East London abode does not demonstrate an appropriate vegetable cultivating environment...surprisingly...]. If this pesto doesn’t convince you to love your carrot top leftovers, I don’t know what will. nibs etc. original recipe. Makes 1 large jar’s worth. Roughly chop the carrot tops, and toss into your blender with the garlic, olive oil, and walnuts. Blend until quite smooth - perhaps resembling the consistency of bread crumbs. Add the grated parmesan, pinch of salt and lemon zest and juice. Pulse until just incorporated. Tip into your jar, topping with a thin layer – 1-2 tbsp – of olive oil to make sure it preserves well. On socca blinis with parmesan rind and cauliflower purée and sautéed mushrooms. Mixed through with cream cheese for an excellent summer garden party crudité dip. With pasta, slathered on meats – really as you’d apply any other pesto. Substituting the walnuts for any other favourite nut of yours: pine, pecan, or hazelnuts.